Not something you see every day. This is the Norwich Dornier, a Do 17z Number U5 EA. The same one featured in various photos of Eaton Park in Norwich, Sitting there like a giant Airfix kit being winched onto a flat back. 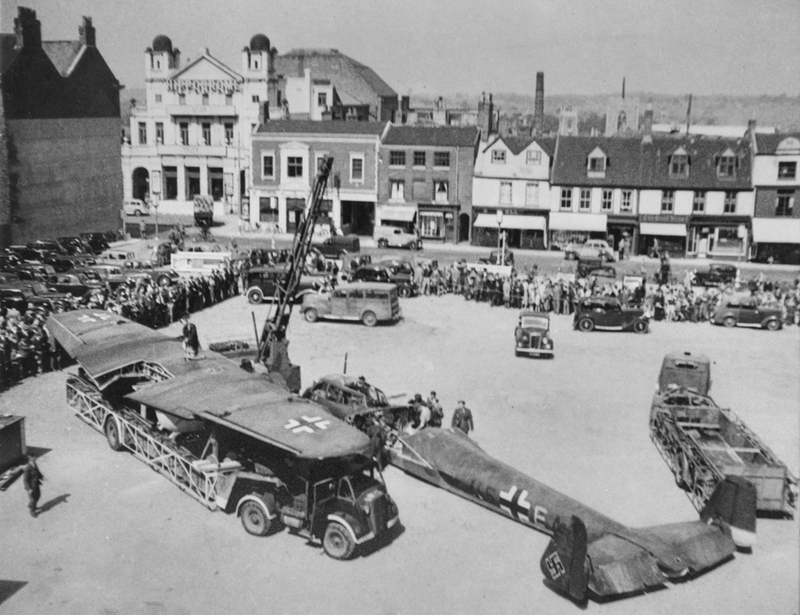 A German Dornier Do17z in bits in the car park behind the City Hall. 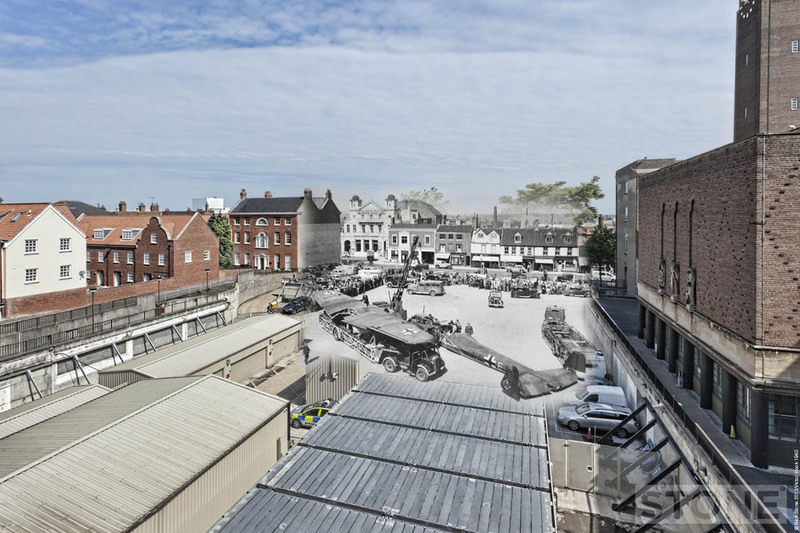 The photograph was taken by Detective Inspector Victor Hook of Norfolk CID from his office window, It went down somewhere between Norwich and Newmarket, whilst returning from an abortive raid on Coventry in the late summer of 1940, shot down by a burst of 3 inch AA fire from 243 Heavy Anti Aircraft Battery a Norwich territorial unit at Duxford. Possibly fired by “Sonny Gudgeon” it skimmed the trees, and was forced down pretty much intact. In the photo it was being put on flat back trucks, I’m not sure if it went from here to Eaton Park, or the other way round. Apparently it was being moved though because it was a target for further German raids. Bob Collis tracked down the surviving crew as reported in the Eastern Evening News in 1986 Joachim Hellmers reported they had been unable to destroy the aircraft as they should have when it crashed. In the background you can see the Hippodrome on St Giles Street, itself a victim of the raids later in the war, and now the stately and elegant lump of concrete where you park sometimes, the one that’s a bit narrow, or is that all car parks? 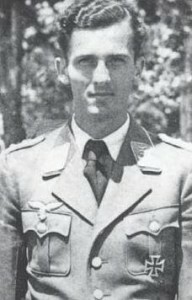 Also via Rob Schäfer at Gott mit uns we have a photo of the chap The pilot, Johann Heinrich Helmers that managed to get it safely down which is on the right. Finally, with the help of my friend Steve Smith and various unnamed other coppers I managed to get into ye olde Norwiche Coppe Shoppe and hang out of the window of Victor Hook’s office as he did in 1940, I hung out of several windows and eventually found the right one causing a vaguely bemused expression from one DC, who was quite intrigued by the 5 minutes disruption, anyway ’tis done; a Dorner D017 in a Car Park. Oddly the actual car park floor is no longer there, the cellar has been opened up, so this is floating above what is there now. You can see the Hippodrome which is nice. In the background you can see the Hippodrome on St Giles Street, itself a victim of the raids later in the war, and now the stately and elegant lump of concrete you park in sometimes, the one that’s a bit narrow, or is that all of them, I forget..
Photo: private collection. © Blitz Ghosts.